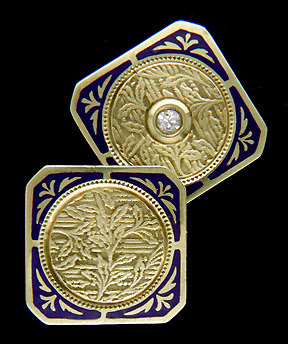 Nature inspired Art Deco cufflinks, circa 1920. The words "Art Deco" inspire thoughts of bold geometric designs and rich contrasting colors celebrating Machine Age chic and a prevailing enthusiasm for streamlined speed. But these iconic themes of the 1920s and 1930s do not exhaust the vocabulary of Art Deco design. Art Deco jewelers, like jewelers during the earlier Victorian period, turned to an eclectic mix of design sources and decorative motifs when seeking inspiration. In the early 1920s, Art Deco blossomed with a garden of stylized plant motifs which offer a natural counterpoint to the starker designs of late Art Deco. The diamond-set cufflink pictured above features aquatic plants floating against a watery, rippling backdrop. In the corners golden lotus blossoms are silhouetted against "pools" of blue enamel. Created by Charles Keller & Company around 1920, this cufflink is a wonderful example of the nature-inspired jewels of the early Art Deco era. Breezy pond cufflink, circa 1920. 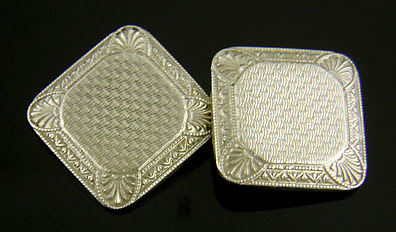 During the 1920s, an unknown maker* created a small body of cufflinks nicknamed "the breezy pond series". The cufflinks feature Art Deco borders of stylized water plants - water lilies, waving grasses and anthemia (palmettes) - surrounding beautifully engine-turned "pond" centers. 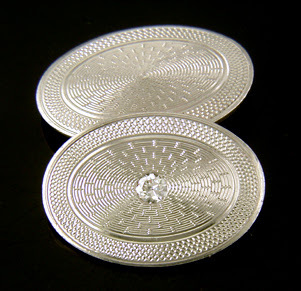 The finely engraved centers sparkle with a wavy pattern that brings to mind the rippling surface of a pond in a brisk breeze. Hence the nickname. 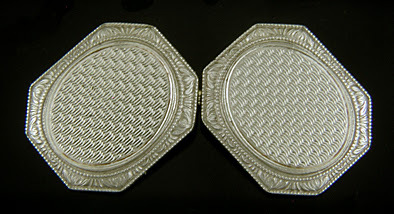 Several examples of these cufflinks are illustrated above and below. As the decade of the 1920s passed, the interest in stylized plant motifs was superseded by the bolder forms and geometric designs which eventually morphed into the starkness of mid-Century Modernism. But, for a brief period the in the early 1920s the Art Deco garden blossomed. * The unknown maker of the last two cufflinks is identified by the maker's mark, a "T" superimposed above an "H". In an earlier post I discussed the possibility that this mystery maker was in some way affiliated with the jewelry firm of Irving Heidelscheimer. Another example of this maker's work is illustrated below. Art Deco cufflink by TH maker, circa 1925. 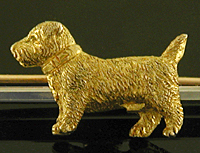 Art Deco Terrier A wonderful Art Deco brooch of a small terrier set against an elegantly simple white gold back bar. Created by Alabaster & Wilson in 15kt and 9kt gold, circa 1925. Deco Jazz Elegant Art Deco cufflinks with jazzy pinstripes and intricate scrolling borders. The perfect blend of the formal elegance and exuberant celebration that epitomized the Jazz Age. Crafted in 14kt white and yellow gold, circa 1925. Tribal Art A bright, bold shield motif accented with stylized spear points frames a mysterious, dark blue sapphire. Art Deco jewelers often found inspiration in what were mislabeled the "primitive" arts of Africa, Oceania and the Americas. Crafted in platinum and 14kt gold, circa 1930.